W906PC Lufkin Chrome Plated DIAMETER Tape Measure, in 64ths of an inch. NOTICE: LUFKIN IS OUT OF STOCK ON THIS TAPE UNTIL THE END OF MAY 2019. Please see the Lufkin Diameter Tape W606p. Your full-color logo will look great on this Diameter Tape. How to use a diameter tape: Measure around the pipe, and read its "diameter" off the tape scale. This was formerly called Y906P, and is also a replacement for the Barlow diameter tape. This tape features a 6' x 1/4" wide blade with an inch scale to 1/16ths. It/s graduated to 1/32ths on the first 12" on front side of blade. Diameter in inches to 64ths on back side of blade. Convenient blank space before zero. Blade style: A18 measures diameter up to 23". Color: Chrome with white vinyl panel on one side. Imprint: One color or full color imprint, same price! 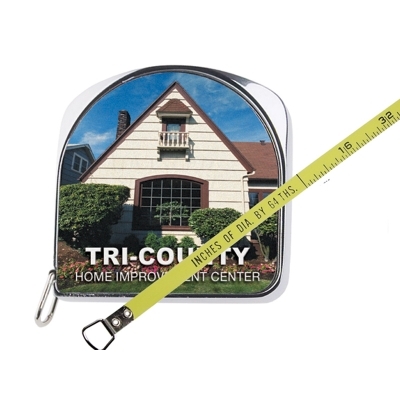 Digitally printed area: 1-3/8" w x 1-1/4" h. Size of tape measure 1 13/16" x 1 13/16". Packaging: 2-piece silver/black GIFT BOX included. Inside the box is a red molded vinyl cradle. Shipping Weight: 3 LBS. PER CARTON OF10.